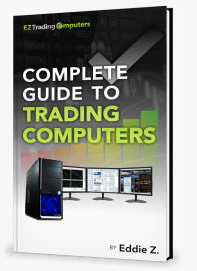 In this post I want to address a few common myths about trading computers I hear all the time from traders calling our office. MYTH: Because the Internet is so vast, the chances of me getting hacked is unlikely. FACT: Just a few years ago (in 2014), we reported that your odds of being hacked were better than 1 in 7. Today, experts tell us we should assume our odds of getting hacked are 100%. From election hacking to hotel and credit card database hacking, chances are your data has already been compromised. Traders need to stay up-to-date on hardware, software, and best security practices to ensure they are protected when (not if) hackers strike. MYTH: Traders need a souped-up, high-end gaming computer to trade on. FACT: Gaming computers usually cost more than traders really need to spend. Traders don’t need a graphics card that does fancy 3D acceleration better than any other card on the market. Gaming computers have too many ultra-expensive components that traders don’t really need. Gamers want immersive graphics. That means fancy techie stuff that makes video games life-like. Traders can take one step down on their graphics card, saving $500 or more. Traders need a souped-up processor, lots of RAM, and a high-end motherboard. Budgeting for a trading computer is simply about investing in the components that matter most to traders—no more, no less. MYTH: As long as I use my computer strictly for trading, my computer isn’t at risk. FACT: If your trading computer is connected to the internet, it’s at risk. There’s a common misconception that just because you don’t download unnecessary and unknown software, or don’t check email on your trading computer, it’s not vulnerable to viruses. There are all sorts of ways to get a virus. Sometimes even your Internet modem can leave you vulnerable (especially if you haven’t kept its firmware up-to-date). Even the best virus programs don’t protect you from every threat. Internet threats change all the time. Protect yourself by assuming all your Internet-connected devices are vulnerable, and regularly checking for security-related updates. MYTH: You’ll have to start over when your computer gets slow. FACT: This is not true at all. Certainly there are some cases where this may be the answer. But, if you have a regular hard drive clean-up and maintenance routine, you can prevent most computer slowdowns. Your Internet history can create a lot of overhead. Your system trash takes up room—files in the Recycle Bin, clipboard history, etc. Your recent document thumbnails take up resources. There can even be “residue” in your computer’s memory from daily operations. Every so often, your system registries need to be cleaned up as well. It’s best to wipe this stuff out occasionally. Windows 10 now has a utility to help. And third-party software (such as ccleaner) can clean up even more junk. MYTH: Windows 7 users should stick with Windows 10 until the bugs are worked out. FACT: Windows 10 has been around long enough now that the initial kinks have been worked out, and the reasons to upgrade far outweigh the downside. Yes, new updates to Windows 10 can be a bit buggy. But Microsoft has heard its users and is working to make the quality and the process better. More importantly, a whole lot of those monthly Windows 10 updates are what’s keeping your trading computer secure from the latest security threats. And, by the way, Windows 7 isn’t free from update bugs, either. If you’ve been listening to any of these old myths, take steps to get yourself back on a better path today. Photo by skeeze on pixabay.com.